← Grand Canyon Retrospective: Day 5- Bright Angel Snowstorm! Last year, dragging my feet through a snowstorm on my way out of the Grand Canyon, I made a deal with myself: I would leave the canyon willingly on the condition that I’d come back every year for another hike. Last week, I once again found myself on the edge of the Earth with a few days of supplies on my back and snow falling from the sky. In the desert, any kind of precipitation is a gift; the canyon was welcoming me back! 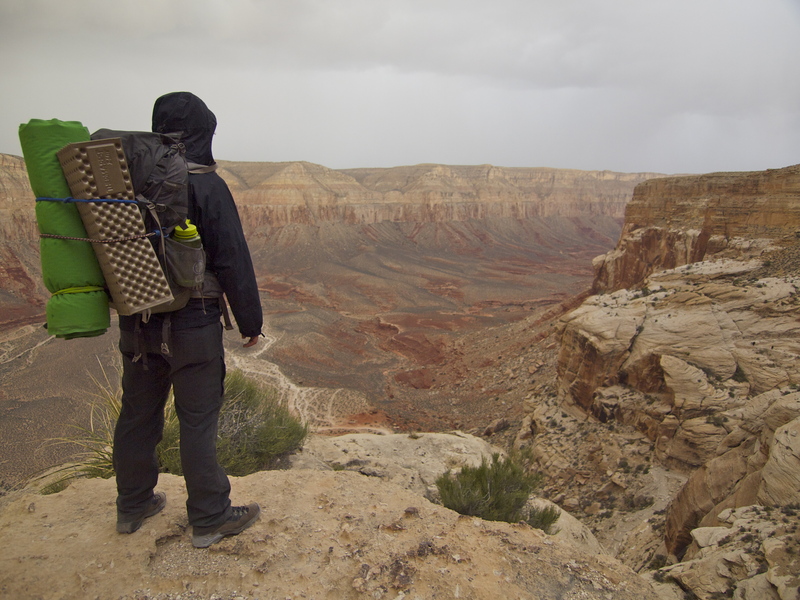 My friend Devin and I descended down into the storm, pelted by marble-sized hail and raked by gritty winds. At one point I took shelter against the canyon wall, afraid I might be swept away into the abyss. I shut my eyes against the flying sand, leaned into the wall, glad for the anchoring weight on my back, and breathed deep the earthy, sandy smell of Coconino sandstone. No place I’d rather be than this canyon in this storm. Storm aside, the trail from Hualapai Hilltop down to Havasu is relatively mild, as far as Grand Canyon trails go. The path is wide enough for several horses to trot abreast, and more sandy than rocky. 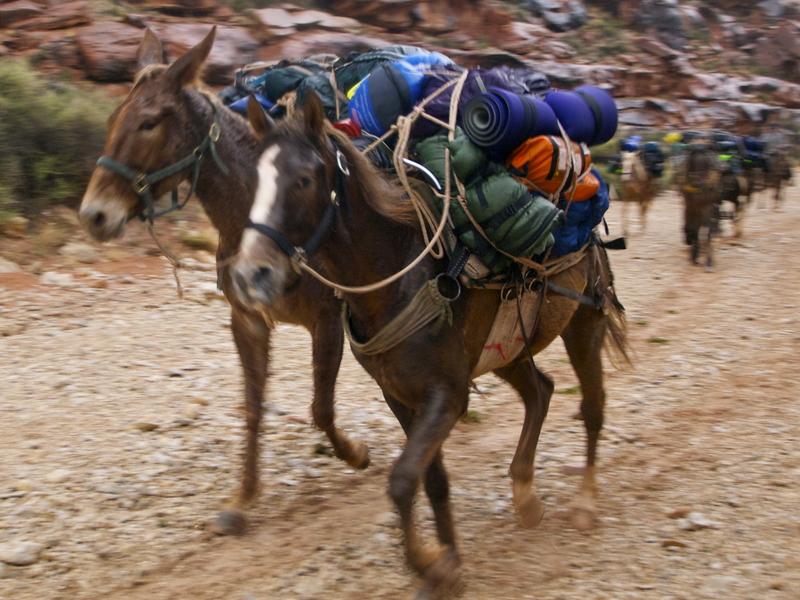 Pack horses hauling camping gear. We carried our own. The trail switchbacks down for the first two miles and then follows the easy gradient of a dry creek bed for the next four. Nearing the intersection with Havasu Canyon, the greenery becomes uncharacteristically lush. First I smelled the water, then heard it and then saw it and gasped: Havasu’s water really is that blue! Havasu’s water owes its super-natural blue color to geology. As rain, snow and hail fall in canyon country, most of the water percolates down through the topmost layer of Kaibab limestone – the type of rock that makes up the canyon rim throughout Grand Canyon National Park – and Redwall limestone – the layer that creates the towering red walls within the canyon – dissolving abundant calcite in the lime-rich rocks and carrying it along in solution. The Grand Canyon’s many layers slope gently south, following the contours of an ancient dome uplifted around the time the Rocky Mountains were formed. As a result, the groundwater on the North Rim of the canyon is relatively young; it flows quickly down through the layers and emerges in springs and along the Colorado River within 40 years of falling from the sky. The South Rim groundwater, however, is ancient. 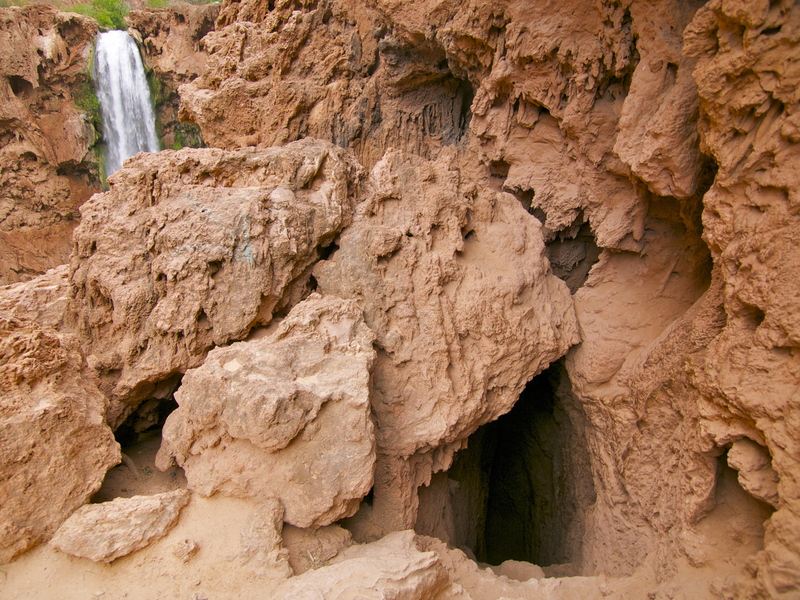 Radioisotope testing indicates that most South Rim water marinates underground for tens of thousands of years before emerging in springs like the ones that feed Havasu Creek. That means lots of time to dissolve lots of calcite. Havasu Canyon is the largest tributary on the Southwest rim; it delivers more than 38 million gallons of water a day downstream to the Colorado River. As it flows, exposure to air and agitation of the water causes some of the dissolved calcite to precipitate out as a mineral called travertine. 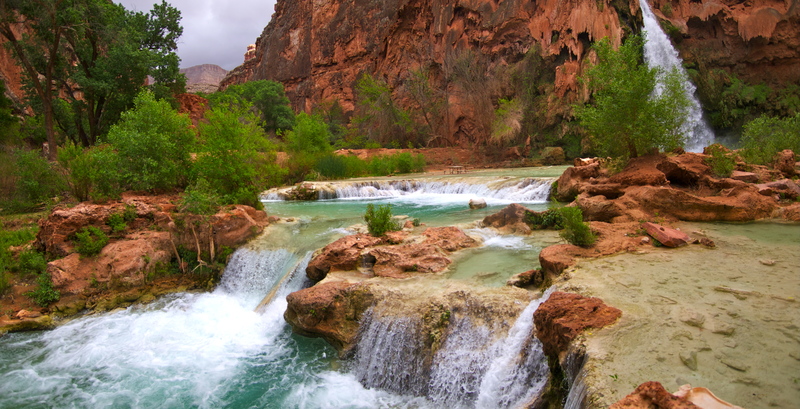 If you look closely at Havasu Creek, you’ll see that the creek bed is coated with grainy white deposits of travertine. Against this white backdrop, the lime-rich, blue-tinged water in Havasu Creek appears even bluer. 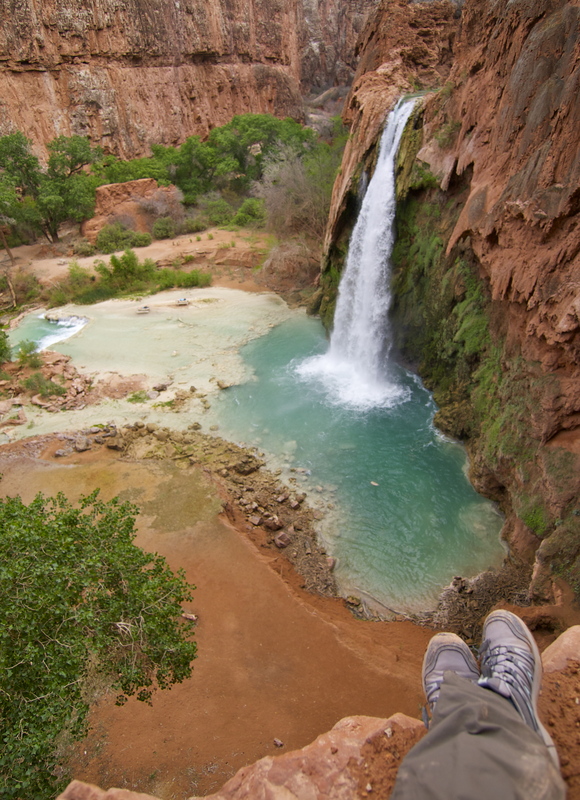 Below Havasu Falls. Notice the white creek bottom in contrast to the red rocks. Each year, more than 30,000 people visit Havasu Creek to see that bright blue water spill over a series of waterfalls, each more spectacular than the last: Navajo Falls, Havasu Falls, End Falls (aka Mooney Falls) and Beaver Falls. This is hardly a wilderness experience; solitude in Havasu is a rare animal, best found in the early morning and downstream of End Falls. 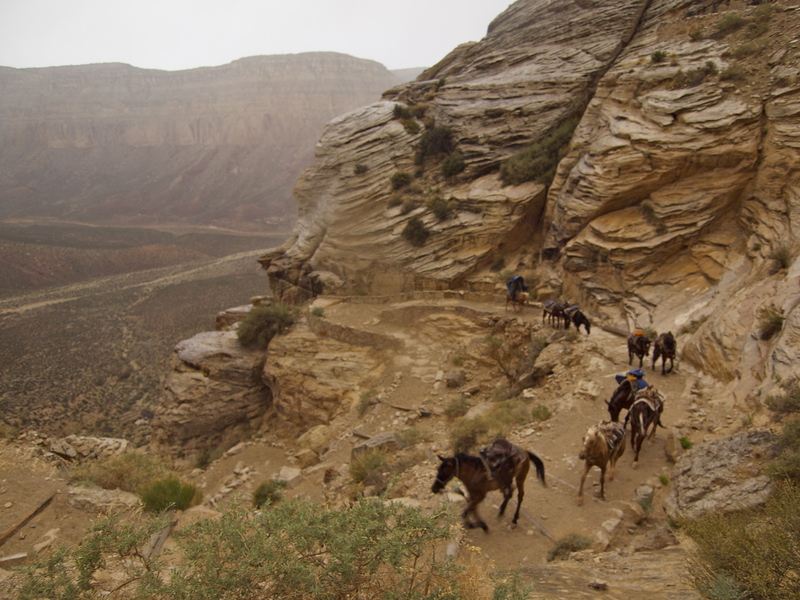 But the place is so spectacularly beautiful and relatively inaccessible – no roads run into the canyon, you must hike or ride down – that I didn’t mind sharing the place with fellow hikers. Our campsite on the edge of End Falls. See the tent above the waterfall? Click to enlarge. After hiking 9 miles in from Hualapai Hilltop, Devin and I set up camp on the very edge of End Falls, the same idyllic spot where Edward Abbey camped for five weeks back in the 1960’s. Then we went looking for the way down. These days, guide books and the internet have taken all the fun out of exploration; with a little research it’s possible to know exactly where you’re going and how to get there at all times. Deliberately, I knew very little about the route below End Falls to the Colorado River. I knew the trail was about 7 miles long, one way, but I had no idea what to expect along the way. Sure enough, the Grand Canyon didn’t disappoint: tunnels and ladders and chains and creek crossings! Stay tuned for our adventure down to the Colorado River! 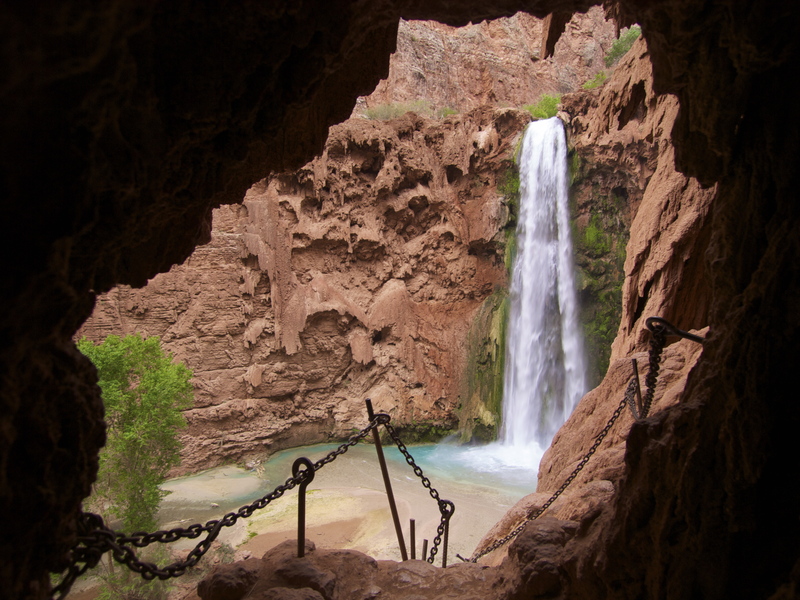 This entry was posted in Hiking!, Photography, Uncategorized, Vagabonding 101 and tagged grand canyon, Havasu, Hualapai Canyon. Bookmark the permalink. 10 Responses to Grand Canyon: Havasu! Hi there! I am planning a trip to Havasu for next April and was trying to find out if dogs are allowed. I know there are some of the day hikes that could be treacherous but my main concern is the village dogs – my dog is a service dog and I just don’t want to put my dog at risk of getting attacked. I wouldn’t take a dog down there for exactly that reason. The village dogs have their own society and I doubt they’d welcome an outsider without some hassling, if not outright hazing.